Herbert Hoover ES art teacher Justin Bursk and Neshaminy High School art teacher Terry O’Neill were both accept­ed into the Artists as Educators exhi­bi­tion at Tyler School of Art, Temple University. This exhib­it pairs an art educator’s art­work with the art­work of their stu­dents. The goal is to pair stu­dents and their teach­ers to cel­e­brate the task of bal­anc­ing a work­ing stu­dio prac­tice with edu­cat­ing the next gen­er­a­tion of artists. 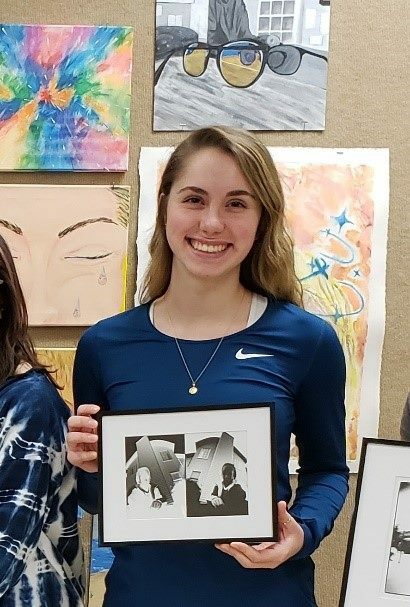 Justin is exhibit­ing one of his paint­ings along­side a col­lage by first grad­er Owen Wetzel and Terry is exhibit­ing a linoleum print next to a pin­hole pho­to­graph by NHS senior Jessica Giacomelli. This is the third annu­al Art Education and Community Arts Practices Alumni Show at Tyler. The open­ing recep­tion was held on February 24 and the works were on dis­play through March 7. Next → Next post: Winners at State DECA!